When a Java program starts, Java Virtual Machine gets some memory from Operating System. Java Virtual Machine or JVM uses this memory for all its need and part of this memory is call java heap memory. Whenever we create object using new operator or by any another means object is allocated memory from Heap and When object dies or garbage collected, memory goes back to Heap space in Java. Tutorial on Increase Eclipse Memory Size to avoid OOM on Startup. It is good practice for big production projects to set the minimum -Xms and maximum -Xmx heap sizes to the same value. For efficient garbage collection, the -Xmn value should be lower than the -Xmx value. Heap size does not determine the amount of memory your process uses. If you monitor your java process with an OS tool like top or task manager, you may see the amount of memory you use exceed the amount you have specified for -Xmx. -Xmx limits the java heap size, java will allocate memory for other things, including a stack for each thread. It is not unusual for the total memory consumption of the VM to exceed the value of -Xmx. Each thread in the VM get’s a stack. The stack size will limit the number of threads that you can have, too big of a stack size and you will run out of memory as each thread is allocated more memory than it needs. -Xss determines the size of the stack: –Xss1024k. 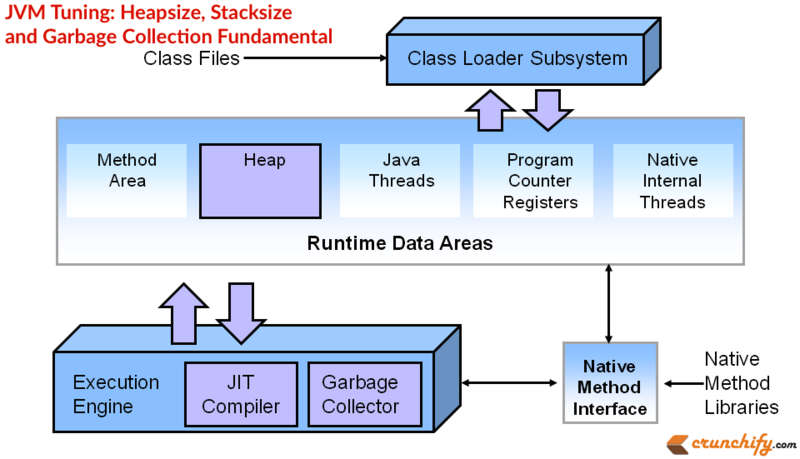 If the stack space is too small, eventually you will see an exception class java.lang.StackOverflowError. There are essentially two GC threads running. One is a very lightweight thread which does “little” collections primarily on the Young generation of the heap. The other is the Full GC thread which traverses the entire heap when there is not enough memory left to allocate space for objects which get promoted from the Young to the older generation(s). If there is a memory leak or inadequate heap allocated, eventually the older generation will start to run out of room causing the Full GC thread to run (nearly) continuously. Since this process stops the world, Java application won’t be able to respond to requests and they’ll start to back up or OOM. The amount allocated for the Young(Eden) generation is the value specified with -Xmn. The amount allocated for the older generation is the value of -Xmx minus the -Xmn. Generally, you don’t want the Eden to be too big or it will take too long for the GC to look through it for space that can be reclaimed.